This case involved a civil prosecution in the Federal Court of Australia of a South Australian farmer for clearing 170 eucalyptus trees, thereby causing a significant impact on a threatened species contrary to section 18 of the Environment Protection and Biodiversity Conservation Act 1999 (Cth). 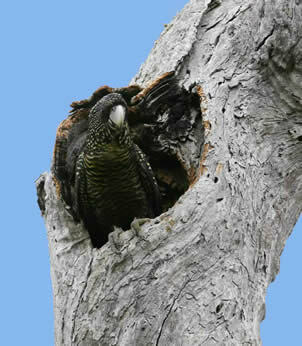 Some of the cleared trees contained nesting hollows for the South-Eastern Red-Tailed Black-Cockatoo, which is listed as endangered under the EPBC Act. Loss of nesting trees due to clearing is considered a key threat for the species and avoiding further clearing is one of the main actions in the recovery plan for the species. The defendant farming company admitted an offence had occurred and consented to a declaration being made and pecuniary penalty being imposed. The Minister and the company agreed that an appropriate penalty was $110,000.
" ... in my view the penalty proposed by the joint submissions is not within the permissible range. The contravention was not within the least serious category of contraventions. The deliberate nature of the conduct, the indifference to its potential consequences, and its significance in relation to the endangered species, and the need for the Court to fix a penalty which will operate as a deterrent to those who might otherwise be minded to clear native vegetation contrary to s 18(3) of the EPBC Act all point to a penalty significantly greater than that suggested, even taking into account all the matters which weigh in the first respondent’s favour to fix a low pecuniary penalty. In my judgment, the appropriate pecuniary penalty is $220,000. ..."
While only a single judge decision, this judgment is significant for highlighting that deliberate offences against the EPBC Act undertaken for commercial gain can be heavily punished. That is important for deterring others from contravening the Act. Application filed 19 December 2007. Statement of Claim filed 19 December 2007. Defence filed 18 February 2008. Joint submissions of the Minister & first respondent consenting to a declaration and pecuniary penalty of $110,000 being imposed. Statement of Agreed Facts filed by the Minister & first respondent (7MB). Note: some of the figures were originally in colour and, due to their size, not all of the attachments to the statement are included). Evidentiary certificate filed by the Minister. Judgment of the Federal Court imposing a pecuniary penalty of $220,000: Minister for Environment Heritage and the Arts v Lamattina  FCA 753 (Mansfield J). Sealed orders (i.e. the final orders stamped and entered by the Court registry) made by Mansfield J on 17 July 2009. * Thankyou to the Australian Government Department of the Enviroment, Water, Heritage and the Arts (DEWHA) for supplying the primary court documents for this case study. 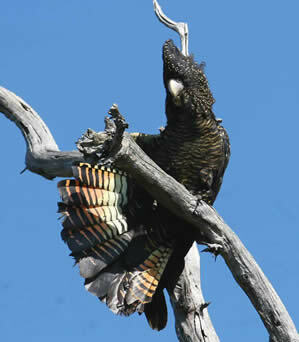 Female South-Eastern Red-Tailed Black-Cockatoo at nesting hollow. 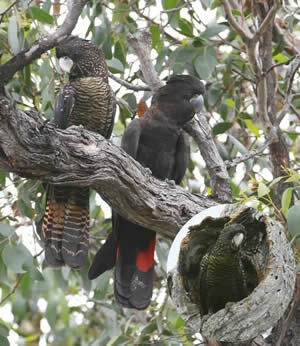 Female and male South-Eastern Red-Tailed Black-Cockatoo with nesting hollow inset.